When entertaining guests it can be hard because you want to serve up Paleo appetizers, but you don’t necessarily need to broadcast that you’re eating a special way. 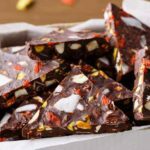 These recipes allow you to give your guests delicious hors d’oeuvres and lets you enjoy the party as well because you’ll be able to snack along with them without worrying if you’re spoiling your dieting efforts. 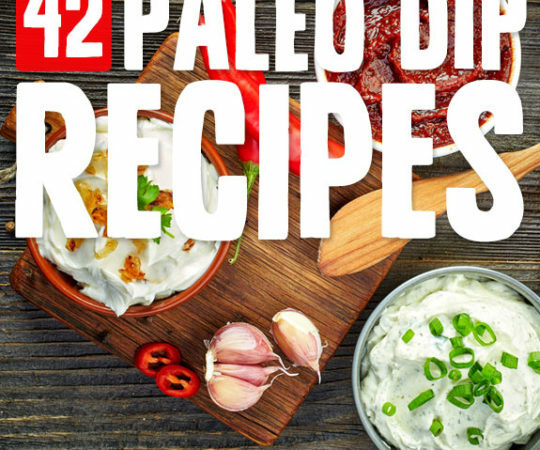 Browse through and choose the ones that jump out at you as you construct the perfect Paleo party food. 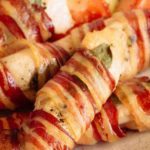 Wrapping something small in bacon is a sure way to make a quick and delicious Paleo appetizer, and here they’re using olives for a tasty snack. 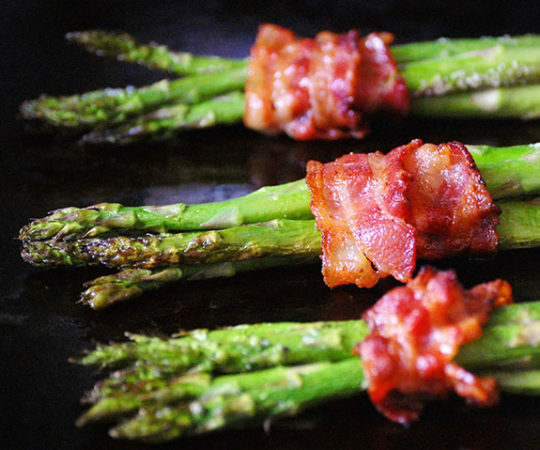 Since bacon is an authorized Paleo food you are free to enjoy it as you like, unlike many other diet programs. You’ll just want to make sure that you are using high quality bacon, choose a package that doesn’t have nitrates, and is uncured. She gives the option of using a little coconut sugar, and that plays really well with the other flavors. The sweetness contrasts with the savory bacon and the tartness of the olives. Oysters are definitely Paleo, as is anything you can basically just pull out of the ocean and eat. 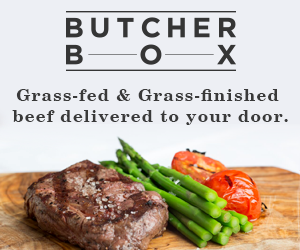 It’s something our ancestors would have been able to do, and you don’t need to worry if the oysters have been tampered with by humans the way chicken and cattle have been. In this spread they’re mixing smoked oysters with red onion and a bit of cheese. With cheese you’ll have to determine whether or not you can process it, and if so, which varieties work for you. Some Paleo followers find they can’t eat any cheese, while others discover they can have hard cheeses in moderation. Lamb doesn’t get the recognition it deserves and usually takes a back seat to chicken and beef, and even pork. But it’s a great meat to serve up on Paleo, and these lamb ribs make a great appetizer for any party you have coming up. They are served with a minty, spicy sauce that goes great with the lamb. Lamb is often served up with mint jelly, so this is an appetizer that takes a traditional serving suggestion and modifies it according to Paleo standards. Here they’ve placed the sauce right on the ribs but you could also serve it on the side as a dipping sauce. Generally nachos wouldn’t be something that you can have on Paleo, thanks to tortilla chips being made from wheat. But these pumpkin nachos shake it up and are an awesome dish to pass around for a game day party or other event. 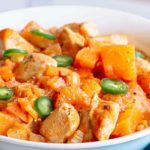 They are using sweet potato chips instead of tortilla chips, and they’ve topped this with a mixture of chicken and pumpkin puree. It may not sound like your traditional plate of nachos, but Paleo is all about doing things in an untraditional way. Or it could be looked at as doing things in the most traditional way possible, by doing things like our early ancestors did. 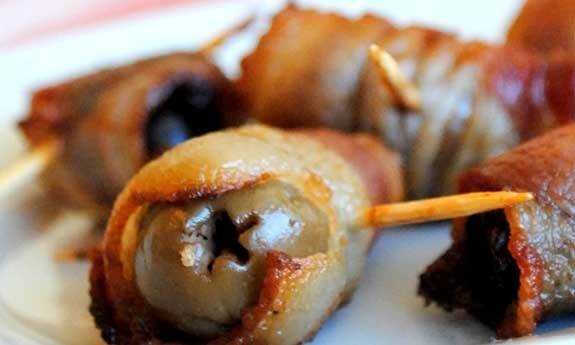 These mushrooms take the essence of Fresh onion dip and serve it all stuffed inside. You get a familiar taste in an unfamiliar packaging. You don’t have to worry about missing the potato chips you typically use for French onion dip, because the mushrooms make it taste great, and also make it bite size so it’s great for popping as an appetizer. These are not ordinary white mushrooms, but are baby portobellos, so they are going to have a richer taste and a heartier texture. This is a good thing, because it goes nicely with the creamy French onion dip inside. 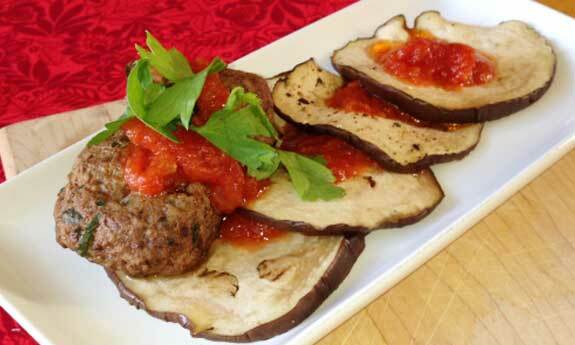 These eggplant slices are served up with meatballs, so your guests will get two treats in one. They are meant to be eaten together, like a meatball served on a cracker, but without any wheat or grain because the cracker is a slice of eggplant. Meatballs are always a good appetizer suggestion, and it’s nice that they’ve paired these two together. The marinara sauce gets placed in between each eggplant slice, and you serve up just a few meatballs with about 4 slices of eggplant so they can eat half a meatball with each slice. 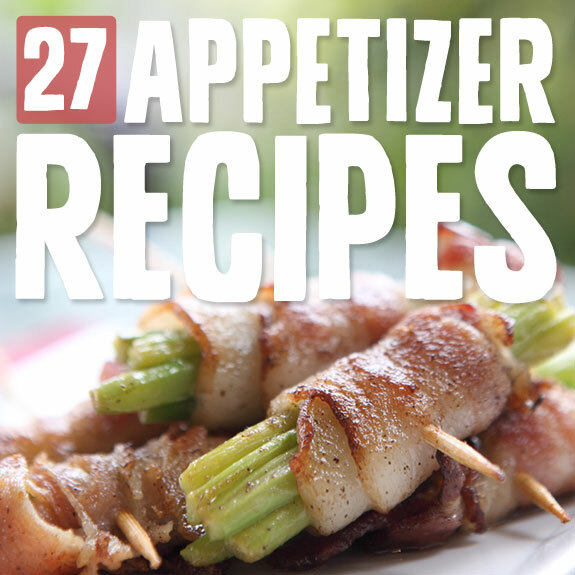 Just three ingredients in this awesome appetizer: bacon, apricots, and water chestnuts. You’ll get the light and crunchy taste and texture from the water chestnuts, the chewy sweet fruitiness from the apricots, and the savory flavor only bacon can provide. This gives many sensations on the palate, and all of the items go together quite well, even though you might not have ever thought of putting apricots with bacon. The small size of these little guys makes them great for serving on a tray for any type of party or get together. Chorizo is a great thing to stuff inside of mushrooms because of its distinct spicy flavor. Luckily they provide a recipe to make your own chorizo so you can have some quality control of what goes in it. 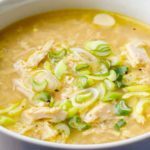 Add to that a bit of onion, and cook it all up in some ghee, and you’ve got a great dish for your guests that stays within the boundaries of Paleo eating. The beauty of these mushrooms is that they don’t take long to make once you have the chorizo ready, and if you happen to have some already made you can whip this up in a hurry. This is a very simple and delicious appetizer that has you grilling up mushrooms and broccoli and serving them up with a tangy sauce. The dipping sauce can be made with either mayo or yogurt. If you want to avoid all dairy, go with mayo because it’s easy enough to make a Paleo mayo, you just have to use the right ingredients and make sure that you are going with a high quality oil and organic eggs. Once you have the mushrooms and broccoli grilled up, it’s a matter of adding some turmeric to it and getting your dip on. 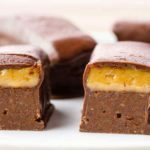 Rolling up Paleo foods is a great way to make a stylish appetizer, and one that can be eaten in one bite. These zucchini rolls are said to be made Italian style, and they contain sundried tomatoes and basil, which is pretty Italian inspired. They’re using organic zucchini, cut into thin strips so that it can be rolled up. There’s also goat cheese being used, and many Paleo followers consider this a better option than using cheese made from cow’s milk. The use of streaky bacon is something you won’t see in other diets, but on Paleo it’s a go so serve it up! 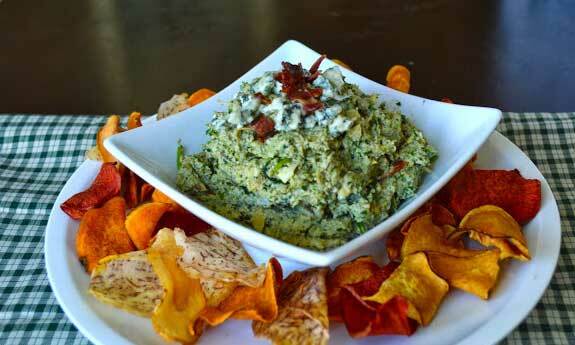 This Paleo recipe serves up a classic spinach dip with a blue cheese twist. This lets you get the flavor of a spinach artichoke dip, mixed with the distinctive blue cheese flavor that you typically associate with chicken wings. That makes it really special, and considering that you’re dipping this with sweet potato chips makes it that much more delicious. Of course we can’t forget to mention the bacon that they’re using, which gives it a taste that you’ll only find with bacon, and it goes great with everything else. Eggs are a Paleo food you’ll find yourself eating on a regular basis, so deviled eggs are a virtual no-brainer when it comes to serving up Paleo friendly appetizers. There are such strong and distinctive flavors in play here that your mouth won’t know what hit it. These aren’t your grandmother’s deviled eggs, with items like capers, sundried tomatoes, and kalamata olives used for the filling. 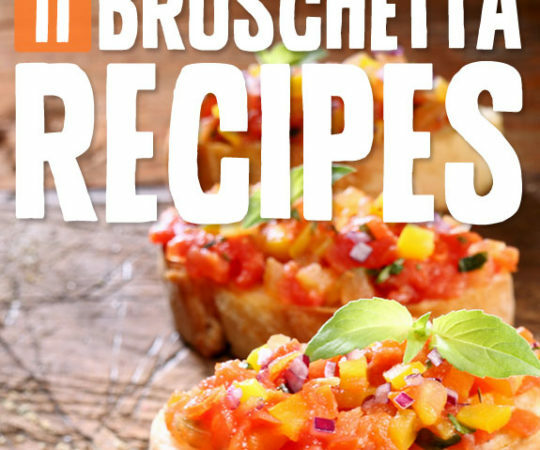 They’ve been dubbed Mediterranean style, and those flavors will definitely come through in these apps. Don’t be surprised if you’re asked for the recipe on this one because they put normal deviled eggs to shame. These are fun little mini dogs that you can serve up at any function, and they’ll even go over well with the little ones. They are wrapped up in a batter made from cauliflower and coconut flour, and here they’ve used Cajun spiced sausages, so they’re going to have a bit of a kick. If serving them to kids you may want to find mini sausages that don’t have any spices added. These are low carb, but on Paleo you don’t have to worry about carb counting or calorie counting, just focus on eating all natural foods. 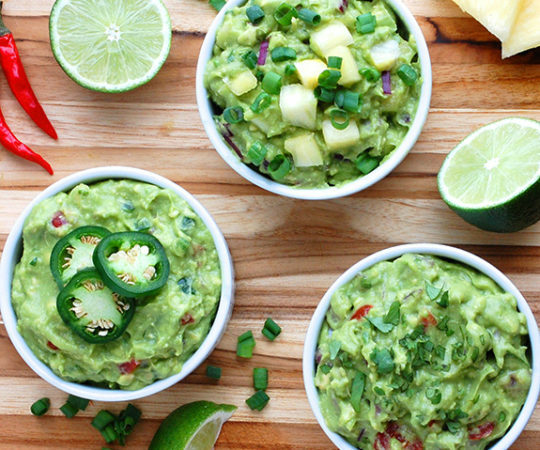 Guacamole is a fantastic Paleo appetizer because it only has a few things added to avocados, and avocados are one of the best things you can eat on Paleo. Here they’re making this extra creamy by using a Paleo mayo that they’ve made from scratch. There’s also jalapeno to spice it up, as well as other peppers and spices so this is going to be very flavorful. Your non-Paleo friends don’t even have to know that this is Paleo, as it will taste like an awesome guac without any special mention of Paleo. This recipe takes two superfoods and puts them together as a refreshing appetizer that can be used as a palate cleanser between dishes. The cool sweetness of the watermelon goes great with avocado because avocado also has a clean and creamy texture. The presentation on these is excellent, the way they’ve made the watermelon into a bed for the diced avocado. 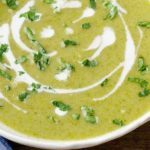 A bit of cucumber and red onion gives this just the right amount of flavor add-ons to get people to nod and say “Mmmm” while they’re eating it. 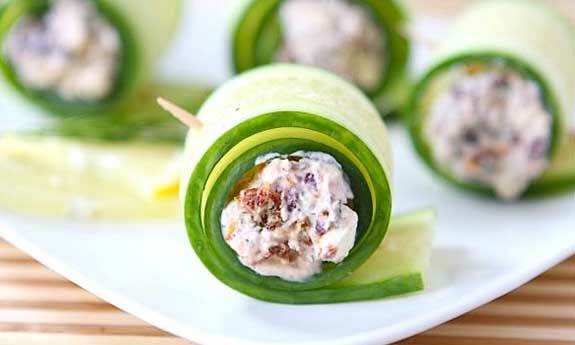 Ham and cucumber combine in these roll ups, making for a nice display so you can serve them up by the trayful. 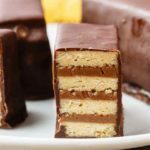 They are also pretty easy to make, so if you have a lot of people coming over and needs something you can make in mass quantities pretty easily, this is your go-to. There is jalapeno added to it so it’s nice and spicy, and Paleo mayo makes an appearance as well so it’s creamy and delicious. It can be picked up with a toothpick and eaten in one bite, the hallmark of any appetizer. These stacks look so good you may not want to see people eating them. But as they say, the better it looks the better it tastes, because it all works on a psychological level. Start with cod on the bottom, and then it’s a layer of tomatoes, a layer of guacamole, and then a layer of mango on the top. There are hatch chiles infused throughout the stack, so the entire thing has a bit of heat to it, but not so much that your eyes will water. Chicken fingers are a great appetizer because people know what they’re getting, and they love to dip them in different sauces. The only problem for Paleo eaters is that most chicken fingers will be coated in a breading that contains wheat flour. These chicken fingers use coconut flour to give them a nice coating that you can feel good about. 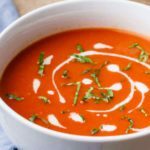 If you want to be awesome you’ll serve these up with an assortment of dipping sauces, there’s even a way to make Paleo ranch dressing and barbecue sauce, as well as honey mustard so there are many choices. This is a classic and fancy appetizer that is Paleo friendly because both of the main ingredients used are Paleo foods. Melon is one of the most Primal and Paleo foods imaginable because they’ve definitely been around in some form for thousands of years. They are enjoyed around the world by all homo sapiens, so they have a sort of universal appeal. Wrapping them up in prosciutto might not be a part of many diet programs out there, but on Paleo it’s a go. Prosciutto is too fatty for many dieters, but Paleo isn’t a low-fat diet. These meatballs have plenty of beef and bacon throughout, so you’re going to get one savory meatball. They are served up in a balsamic tomato sauce, so you’ll be getting the benefit of cooked tomatoes and the lycopene they contain. We’ve seen bacon wrapped meatballs before, but it’s nice to have the bacon mixed right in with the beef. 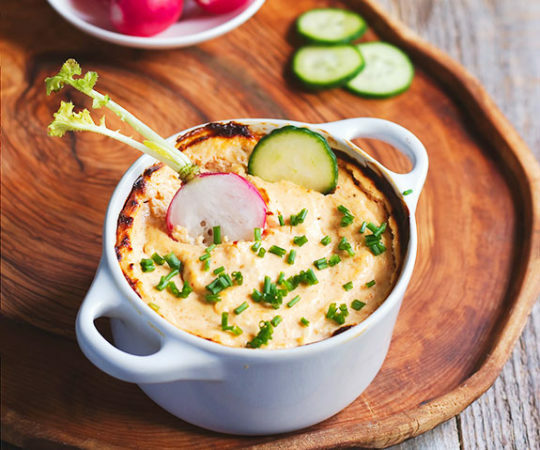 These are a hearty appetizer, so you want to make sure that your guests will have enough of an appetite for the main course. If you are only serving appetizers then these are a great way for them to fill up and feel satisfied with only finger foods. 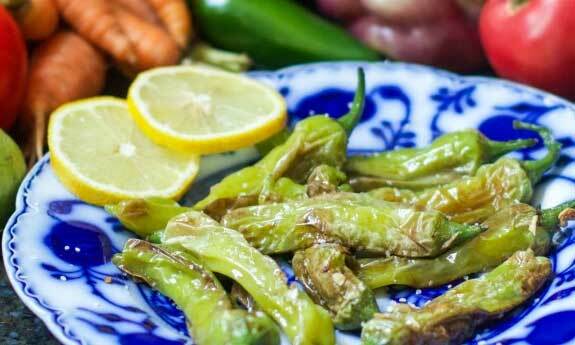 You can’t get more Paleo for an appetizer than frying up some peppers. These peppers are originally from Japan but can be locally grown. They have used a nice mix of salt, lemon juice, and garlic, so you won’t feel like you are only eating a pepper that’s been fried. But really that’s what this is, and it’s nice not to have a ton of ingredients because that makes it more unlikely that it’s Paleo friendly. Serve these up for a spicy but not too spicy appetizer. 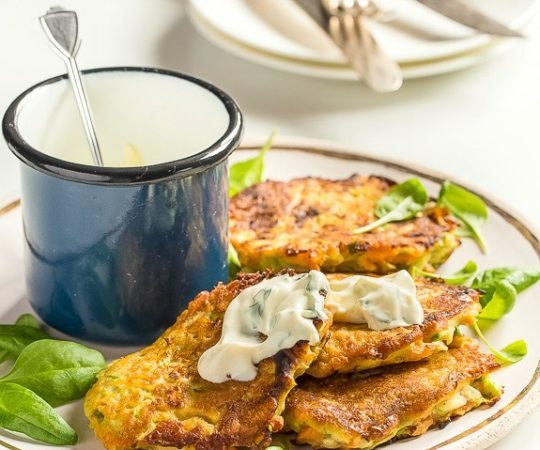 These polenta cakes are made with traditional Spanish influence, but in a way that makes them Paleo friendly. It’s also a dish that vegetarians will appreciate, as well as those looking to cut out dairy or gluten. With so many people doing so many different diets, it’s becoming harder and harder to host a party and appeal to everyone. These should be a crowd pleaser with most. 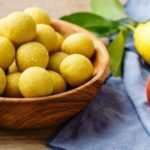 Paleo purists will want to stay away from this, as polenta is made from cornmeal and corn isn’t a Paleo food, but many followers will allow a dish like this. There’s nothing wrong with chicken wrapped up in pastrami, as long as you’re following the Paleo plan. They’ve really outdone themselves with this one, as you can see there’s a nice sauce with these made from adobo chilis and barbecue sauce. Be sure to make your own BBQ sauce from scratch, or check the label to make sure that it doesn’t contain any unauthorized ingredients. You may have to start being a bit pickier on Paleo than you used to be. Using high quality ingredients is part of the philosophy. These deviled eggs use avocado as the filling, so they look like something pulled from a Dr. Seuss book. But as far as flavor goes, you’d be hard-pressed to find a tastier deviled egg. Eggs and avocados are Paleo staples, so you don’t have to feel like you’re having anything bad while eating these, and the green color is sure to have party goers asking you what these are. Once they get a bite they’ll realize they’ve just had one of the better deviled eggs they’ve ever tasted. These chicken bites scream appetizer, and if you serve them up your guests will definitely be happy. You can make up as many as you need to serve to a small gathering or a virtual army. It basically boils down to chicken, jalapenos, and bacon, so how can you go wrong? 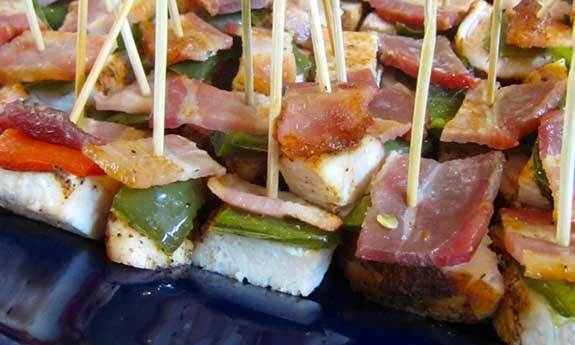 The chicken and bacon provide protein, while the jalapenos spice it up and give it a nice flavor. There is even a special seasoning being used that’s specially made to be Paleo friendly. These fries do not use potatoes, since potatoes are not allowed on Paleo. They are also baked, not fried, so they’ll come out crispy without using so much oil. They’re actually cut into wedges, so you get a nice sized piece of zucchini, as well as a vegetable serving. 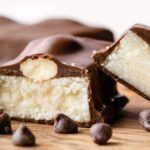 They are coated in a mixture of coconut flour and almond flour, so they’ll come out nice and crispy, so your guests will feel like they’re eating something special at the party. You can also serve them up with various dipping sauces for added novelty. These little guys look like sliders, but they’re really made by sandwiching bacon in between scallops. The scallops get cut in half and serve as the bun, with a nice piece of savory bacon cooked just right used as the filler. They’ve added a bit of shallot sauce to the top of them for added garnishment and flavor. The whole lot is held together by a toothpick for easy eating. Bacon and scallops are a combination used in many restaurants across the country, so it’s a sure winner here, and totally Paleo. 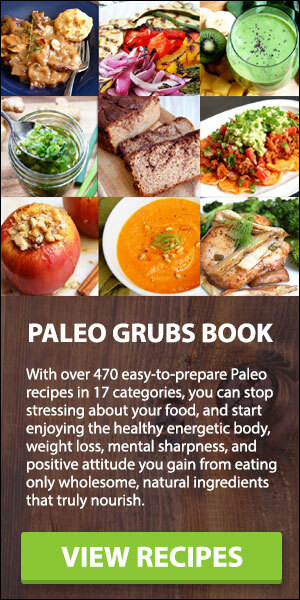 Just started looking into Paleo way of eating and you are the first I came across. Your food combinations and ideas are brilliant! I was wandering, are chestnuts included in the Paleo plan? © 2019 Paleo Grubs. All rights reserved.